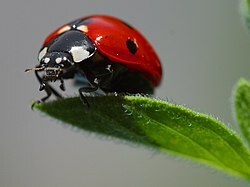 1 Learn about the ladybug. What are the characteristics of the ladybug? 2 Describe the lifecycle of the ladybug. Make a poster. 4 Make 2 ladybug pet rocks. Give one away. 5 What day of the week did God create ladybugs? Learn about the ladybug. What are the characteristics of the ladybug? Ladybugs (also called lady birds and lady beetles) are small, oval-shaped winged insects. These shiny insects are usually red with black spots or black with red spots on the wing covers. The number of spots identifies the type of ladybug. Most ladybugs are less than 1/4 inch (4–8 mm) long. As ladybugs age, the color of the spots fade. Birds are the major predator of the ladybug. Ladybugs will play dead when threatened. DIET: These tiny predators are usually very welcome in gardens because ladybug larvae and adults eat aphids, mealybugs, and mites (which are garden pests). Ladybug larvae can eat about 25 aphids a day; adults can eat over 50. There are about 5,000 different species of ladybugs throughout the world. A common species is the two-spotted ladybug; it is orange red with one black spot on each wing cover. ANATOMY Ladybugs are winged insects (a type of beetle). When they are not flying, the flight wings are covered and protected by a pair of modified wings (called elytra). When flying, the elytras open up, allowing the wings to move. The area above the elytra is called the pronotum (it is part of the thorax). The pronotum frequently has grayish spots on it. The head of the ladybug is very tiny (and frequently confused with the pronotum). Females are larger than males. - A three-part body consisting of the: Head,Thorax,and Abdomen. Describe the lifecycle of the ladybug. Make a poster. The ladybug, like all beetles, undergoes a complete metamorphosis during its life. The life stages of the ladybug are: egg --> larva --> pupa --> adult. 1. Female ladybugs lay tiny Eggs, usually laid in a small mass (fertilization is internal). 2. The Larvae that hatches from the egg is small and long and has 6 legs. 3a. Pupa1 As it rapidly grows, the larva molts (sheds its skin) several times. 3b. Pupa2 After reaching full size, the larvae attaches itself to a plant leaf or stem (by its "tail"). 3c. Pupa3 The larval skin then splits down the back, exposing the pupa. 3d. The pupa is about the size of the adult but is all wrapped up, protecting the ladybug while the it undergoes metamorphosis into its adult stage. 4. Adult Ladybug This last stage in the metamorphosis takes a few days. There are over 450 species in North America. Some are black or vary from reddish-orange to pale yellow. The most common in the US is the Convergent Lady Beetle, which is orange with black spots and the number of spots vary per species. There are 5 states in the U.S. that have the Ladybug as the state insect. Make 2 ladybug pet rocks. Give one away. Completely wash and dry all rocks. Paint rocks in desired colors, allow to dry. Apply second and third coats if needed. Lighter colors will require more coats than darker shades. Paint head on using black acrylic craft paint. There is no pattern needed, simply paint about ¼ of the rock black in the "front." Use a black permanent marker to draw a straight line down the center of the rock, starting at the center of the base of the "head." Dip the end of a large paint brush, or the eraser of a pencil, in black craft paint. Dot on the spots, reloading with paint after every dot. Once the paint is dry, spray the rock(s) with acrylic sealer spray. Allow sealer to dry completely. Using white craft glue, attach wiggle eyes and let dry. Tips: If you are doing this in a group setting such as Adventurers or a classroom, you may find it easier to prepare the rocks ahead of time. Wash, dry and apply a coat of gesso (recommended: Liquitex Basics Gesso) to each rock. This is a craft medium (white) that works well with many projects. It will also create a base so that less coats of color paint will be required. Bigger rocks are easier for small hands to manipulate. They are also heavier, so be sure that there are enough adult helpers for a group of little ones. White and black paint can be used instead of wiggle eyes. Simply dot on white paint, allow to dry, then use a smaller tool to dot on the black. If you cannot find suitable rocks outside, you can purchase them at most craft stories. What day of the week did God create ladybugs? Ladybug was created on the 6th day. There are nearly 5,000 different kinds of ladybugs worldwide and 400 which live in North America. A female ladybug will lay more than 1,000 eggs in her lifetime. A ladybug beats its wings 85 times a second when it flies. Aphids are a ladybug's favorite food. Ladybugs chew from side to side and not up and down like people do. A gallon jar will hold from 72,000 to 80,000 ladybugs. Ladybugs make a chemical that smells and tastes terrible so that birds and other predators won't eat them. The spots on a ladybug fade as the ladybug gets older. During hibernation, ladybugs feed on their stored fat. Ladybugs won't fly if the temperature is below 55 degrees Fahrenheit. The ladybug is the official state insect of Delaware, Massachusetts, New Hampshire, Ohio, and Tennessee. The male ladybug is usually smaller than the female. The Asian Lady Beetle can live up to 2-3 years.